The new Breathless Punta Cana Resort & Spa. The first of a new AMResorts brand (the others are Zoëtry Wellness & Spa Resorts, Secrets, Dreams, Now and Sunscape Resorts & Spas), this adults-only all-inclusive opened in November. 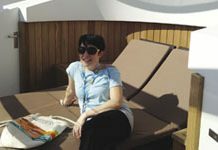 Whereas many other adults-only resorts focus on romance, Breathless Resorts & Spas does that but also offers almost nonstop socializing and partying—and welcomes singles as well as couples. 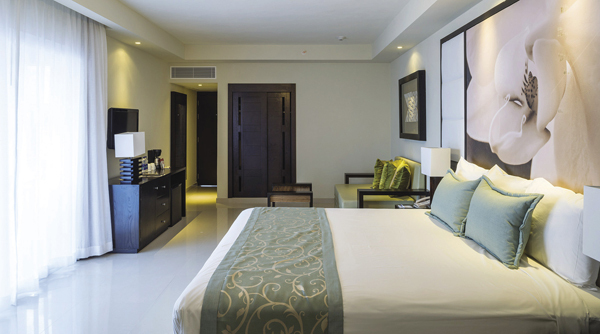 • There’s not a bad room in the house; this is an all-suite hotel. 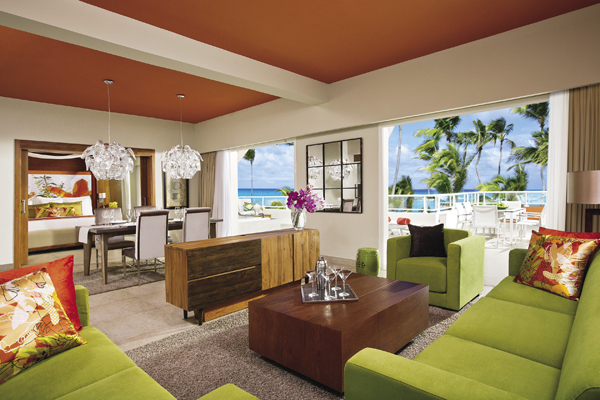 • The decor, like the whole resort, is fun: No cool beige-on-beige here; Breathless’ suites combine clean modernism with green and orange hues that pop. • Because there are 750 suites, Breathless has enough guests to offer a great choice of restaurants and partying venues—and to keep them lively, exciting. Its Unlimited-Luxury vacation includes eight bars and lounges, a cigar bar, and 13 restaurants ranging from traditional Italian to 21st century fusion. No reservations are required, and four of the restaurants have communal tables. • Couples who still want some time alone can call for 24-hour room service or dinner for two on the beach. And Punta Cana’s wide, white beaches, of course, are spectacular. 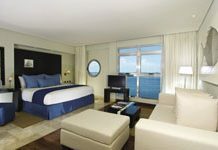 • AMResorts has also created an Xhale Club offering upgraded suites, private lounges, private pools and other perks. Rates start at $152.50 pp for an Allure Junior Suite Tropical View; note that upgrades to each higher category only cost about $8-$16 more, so your clients can be Xhale Club guests for as little as $206 pp. AMResorts pays travel agents 10 percent commission and can include scheduled or charter air. Its Travel Agent Rewards program offers bonuses, free nights and prizes. The online Master Agent Program also includes benefits. 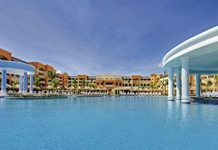 The fact that this 525-unit resort and the Royalton Punta Cana are adjacent is good for guests, parent company Blue Diamond Hotels & Resorts, tour operators and agents. Not bad; have we left anyone out? • Unlike most other children’s programs at resorts, Memories Splash’s Kids Adventures accepts children as young as 4. Also, adolescents (13-17) have a Teen Lounge, so Memories Splash is great for parents who need some time off from the kids and whose children would enjoy these programs (which, we think, would be hard not to enjoy). • “Our Splash Park is the Caribbean’s largest onsite resort water park!” says Todd Kirlik, Blue Diamond Hotels & Resorts’ director of sales and marketing. It has thrilling water slides for adults as well as kids, a splash park for tykes, and food service for those who cannot bear to leave at lunchtime. • All the resort’s restaurants have kids’ menus, and there’s room service from 7 a.m.-9 p.m.; no reservations needed. • Rooms start at $220.35 for two adults; $330.85 for a family of four, and many units will even accommodate five occupants. • Lest the adults be forgotten, Memories Splash has 10 bars, in-room mini-bars, a spa, a theater, live music, watersports, tennis, fitness classes, organized games, slot machines, and babysitting (extra). Sister resort Royalton lies between Memories Splash and the beach, but that beach is just a 10-minute walk, and there’s also a shuttle. • Families who want early check-in and late check-out, 24-hour concierge service, an exclusive beach area, and spa discounts, etc., can join the Diamond Club ($35 pp per day) or book the Royalton. At press time, Blue Diamond was revamping its commission structures and finalizing other incentives for agents. Stay tuned for updates. Accommodations at Royalton Punta Cana. This All-In Luxury resort caters to both families and couples. Between that and its more upscale amenities, it has a more sophisticated vibe. • It’s directly on Bavaro Beach, and to reiterate the obvious, Punta Cana’s beaches are beyond merely sublime. • Guests enjoy reservations-free dining at 11 restaurants, from a steakhouse to a trattoria to a tapas bar. • The 10 bars range from swank lounges to swim-up bars to a sports bar that guarantees airings of all major North American sporting events. There’s a theater and a nightclub, too. • Not only is there a day camp, but guests may use Memory Splash’s grand water park. • Tennis, non-motorized watersports, fitness classes in and outside the gym, and many activities are included. The adults-only pool is one more reason why couples will be happier here than at Memories. • Rooms start at $258.05 (two adults dbl), or $386.75 for a family of four, which is not dramatically higher than the rates for Memories, so clients may well be open to the idea of moving up to the Royalton. Again, Blue Diamond has not finalized its agent commission structures and other incentives, but the announcement is imminent. Pointe Suite at Sandals LaSource Grenada. This property was a sad sight after Hurricane Ivan lowered the boom in 2004. The 100-unit sister resort of LeSport The BodyHoliday (Saint Lucia), Ivan forced it to close, and it didn’t reopen until 2008, just in time for the recession. On Dec. 21, LaSource reopened as a 231-unit Sandals—the first Sandals Resorts International (SRI) property—on stunning Grenada, which has historically lacked internationally managed hotels. vacation experience.” The variety of rooms is formidable, too, yet every unit has tasteful, contemporary furniture, marble floors, and stunning baths. • The new 5-story Italian Village buildings include 1-bedroom, split-level suites with spacious baths and Japanese-style soaking tubs (from $554 pp), and extravagant suites with butler pantries, claw-foot bathtubs, etc. 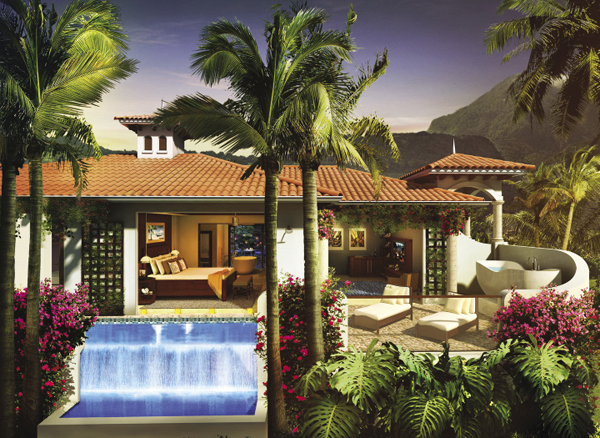 featuring glass tile plunge pools, 65-inch TVs, private entrances, etc. (from $719 pp). 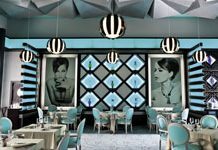 • The new LaSource has nine dining venues, including Sandals’ first steakhouse, both sushi and teppanyaki restaurants, a Mediterranean beach bar, and French, Italian, and Caribbean restaurants, too. • The indoor/outdoor Wellness Center includes a sparkling new gym, venues for fitness classes, waterfalls, etc. 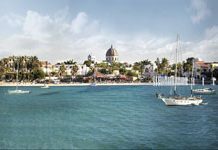 • Partner Island Routes (islandroutes.com) can help guests explore the Spice Island’s unspoiled forest preserves, rural communities, historic buildings, dive sites, and more. As always, Sandals offers incentives including its Certified Sandals Specialists program, Preferred Sandals Agency partnership, Chairman’s Royal Club, and Travel Agent Portal with co-branded site.